WordPress versions: from 2.3 to 2.7.1 according to author’s information. I made my tests with WordPress 3.1, single. It allows to customize URL for login, logout and register links. For example, it is possible to set login URL to "http://www.yourblog.com/login-wp-1870" instead of standard "/wp-login" one. As especially notable feature I wish to mark the so-called “Stealth mode”, which could be realized with the help of this plugin. It denies direct access to ‘wp-login.php’ script. That is link like "http://yourblog.com/wp-login.php" will not work if you activate stealth mode feature. Using more difficult to guess login link as minimum prevents your site from exploring that dark armies of dummy bots, which try to brute force your blog administrator’s password and penetrate into it. After blog penetration you will get a lot of spam as posts and comments in the best case. In the worst case you site could be used as participant of criminal attacks to other Internet resources. How it works? Nothing mysterious. It uses .htaccess URL rewrite engine for that purpose. Did you ever look into your blog .htaccess file? If “Yes”, you are a Web developer or experienced user possibly. A lot of bloggers never looked into theirs .htaccess file. I’m sure. Make it now. What does all that “bla-bla-bla” mean?! I think, you know the answer on the question about the purpose of “Stealth Login” plugin now. It make difficult work for you and you still could know nothing or very little about .htaccess URL rewrite rools :). But let’s return to our review now. About what do we talk? Yes. 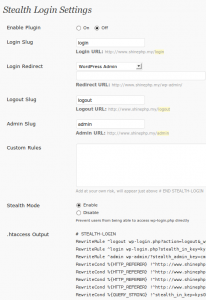 “Stealth Login” plugin. Take a look on its settings page screen shot to the left. You can click on it to get a full size image. 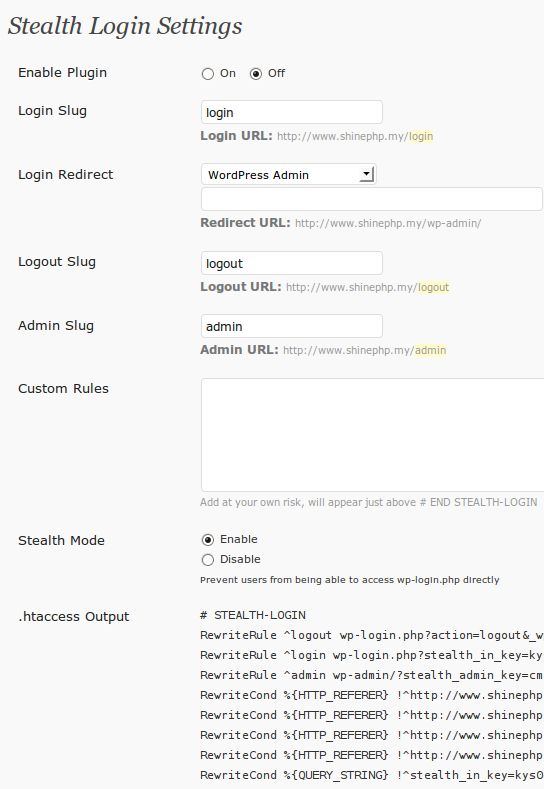 How it works if you try to access your admin back-end with the “Stealth mode” activated? You automatically will be redirected to your blog home page. Good decision. I went through the code. It is accurate, well structured and doesn’t contain any features unrelated to plugin functionality. That is there are no any security threats found in it. Good things and positive impressions about this plugin are finished. There is a security hole in the declared defense of this plugin: way to bypass Stealth Login. The last update of “Stealth Login” was too long ago: 2009-3-4, about 2 years ago. I checked the author’s personal site http://devbits.ca/ It has 2 posts only made in September 2010. Author wrote about his intention to refactor his plugins and … That was the end. Its a pity. May be he will return and continue his work. Plugin still is in intensive use. Users download it about 50-60 times daily. So, decision to use “Stealth Login” or not is for you. Finally, I think that this security addition to WordPress could be useful (after testing on the test installation, do not crash you alive blog :)) for those of bloggers, who can’t use Apache HTTP authentication feature, which could be configured manually according to the documentation or tutorial, or via your site control panel “protected directory” feature. 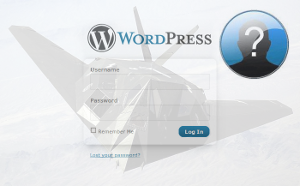 This entry was posted on Saturday, March 12th, 2011 at 07:31	and is filed under Security, WordPress. You can follow any responses to this entry through the RSS 2.0 feed. You can skip to the end and leave a response. Pinging is currently not allowed.